The people ask John who he is, and he replies, ‘I am the voice of one crying out in the wilderness, make straight the way of the Lord’. So what is John saying about himself? 1. He is the voice. I was speaking with a lady this week who said that her daughter had been invited for an interview by the owner of the TV programme ‘The Voice’. Those of you who know the programme will know that what is important about the contestants is not who they are or what they look like: the judges don’t know anything about them and they can’t see them. All that matters - at the beginning - is their voice. John is very aware that he is simply a voice, the messenger. What is important about him is not who he is, but his voice. What is important is the message that he has come to bring. They ask him if he is the Messiah. He says no. He says no, quite emphatically. So then they ask him if he is Elijah or the prophet? So it seems that others are aware that John the Baptist is that predicted figure who will come before the Messiah. But either John is not aware of it, or if he is, he is not letting on. I think that John knows that if he tells people that he is the Elijah figure promised in the Old Testament, then people will focus on him, and they will not listen to the message. And he wants them to know that he is a voice – and they have to listen to what he says. There is something extremely attractive about John’s self-denying ministry. John tells his followers, “I’m not even worthy enough to kneel down at his feet and to untie his boot laces”. And when some of his followers start to speak of Jesus and are drawn to follow him, John blesses them, “He must become greater and I must become less”. Here he says, ‘I baptise with water, but he will baptise with the Holy Spirit’. It is very easy for those of us in ministry to become obsessed with our own importance. That is particularly the case in a society which treats priests or pastors with respect. I have been called ‘sir’, ‘your grace’ and ‘your eminence’. I have probably been called quite a few other things which I haven’t been able to understand, and which are probably unrepeatable. But actually, those in the ministry, whether pastors or priests or bishops or archbishops, need to remember that we are nothing. A number of years ago, I was at a service at St Edmundsbury Cathedral when we were saying goodbye to our Diocesan bishop. He came into church dressed in all his regalia. During the service, he took it all off, he left it at the foot of the cross, and he walked out as Richard. What is important is not us, but our message. We too are simply voices. And what was John’s message? We’re told in the very next verse after our reading. If we are to be faithful, and now I am speaking to all of us, then we are primarily voices and we point people away from ourselves, and we point them to Jesus. Because it is Jesus who was the eternal Son of God, who stepped from heaven to earth, from eternity into time, and who became a human being because he loves us. It is Jesus who died on the cross for our sins and our forgiveness and it is Jesus who rose from the dead. It is Jesus who gives the Spirit, it is Jesus who is our Lord and our saviour and our friend. And it is Jesus who takes us by the hand and who leads us into the presence of his Father, so that his Father becomes our Father. We had a discussion in the confirmation group about whether the church should be more professional in its approach to making the message known. Maybe we should, but I note that John isn’t. He doesn’t have the equivalent of a high social or media profile. Basically, he doesn’t do any of the things that I - rather pathetically - try to do. Instead John goes out into the wilderness, the most remote place possible. He doesn’t make it easy for people, or go out of his way to be nice to them when they come. Instead he expects God to bring people to him, and when they come to him he preaches an uncompromising message about repentance and changing the way you live. And he baptises those who are willing to publicly repent. It is not the way to win friends or influence people and it was an approach which eventually cost him his life. But the fact that he is in the wilderness is very significant, and I am going to go so far as to say that we are never going to really meet with God unless we are prepared to be led into the wilderness. When John says, ‘I am the voice of one crying out in the wilderness’, he is quoting the prophet Isaiah. Isaiah is speaking to the people of Israel who have experienced the terrifying judgement of God. They’ve rebelled against God, they have put their trust in false gods and they have disobeyed him. And now they have been defeated, and crushed. The temple has been destroyed and the people have been taken away to Babylon, into the desert. But Isaiah’s message in Isaiah 40, is now not one of judgement, but of comfort. If you have listened to the Messiah recently then you will probably have been struck by the aria, ‘Comfort ye, comfort ye My people, saith your God’. Those are the opening words of Isaiah 40. Isaiah has come to declare to a people who are in the wilderness, that God has not abandoned them, that there is forgiveness of sins, that there is hope and that he will lead them into a new place of abundance. The wilderness is the place of judgement. It is the place where all the little gods in which we put our trust – money, status, strength, beauty, education (I was at Cambridge, I am at MGU), fitness, entertainment, hard work, the mobile phone, music, family – are taken away. And it is the place where all the little goals that we give ourselves become rather meaningless. There really is no point in trying to prove – to the world, to our family, to ourselves - that we are somebody, that we are important. Because in the wilderness we are not. We find ourselves stripped naked. And we are brought face to face with ourselves: with our sinfulness, our pride, our inability to really love, the desires that overwhelm us, our sheer pathetic helplessness and our mortality. It does not have to be a literal wilderness, although some people find that it is helpful to go right away from everything. Or when we fast we can find ourselves walking into the wilderness. Or – and this is more often what happens - the wilderness can come to us: in the shape of catastrophic failure or sickness or depression or abandonment or bereavement. But the wilderness is also not only the place of judgement, where our little gods are judged, it is also the place of comfort, the place where God comes to us. It is the place where God met with Moses and Elijah. It is the place where Isaiah was called to preach, and where John went to preach. And the Son of God came to us at Christmas in the metaphorical wilderness. He was laid in a manger, because there was no room for him in the inn. He was crucified on a hill outside the city. And it is when we are in the wilderness that we begin to hear the word that comes from God: that we are beloved, that there is one we can turn to for help, that we can change and that we will be changed, that we have a hope and a future. I’ve spoken quite a bit about Michael who had Motor Neurones disease. For the last year of his life Michael had to sleep with an oxygen mask on his face. When his mask was on he could not make himself heard, and since he could not move, he was completely cut off from the outside world. Nobody would hear him if he cried out. That strikes me as being pretty extreme wilderness. And yet he spoke to me about how those times were both very dark and yet very special. He was utterly dependent on God, and at those times it was only him and his God. It is very interesting that in John’s gospel, John the Baptist makes straight the way of the Lord not by calling people to repentance, but by simply being in the wilderness, pointing people to Jesus. A few weeks ago, Alison and myself visited the Tretyakov gallery. We whisked through the first few rooms because we wanted to get to the icon section, and I didn’t know any short cuts, but as we walked past one gallery we looked in and saw this. It is a huge canvas that takes up a whole wall, Ivanov’s Opus Magnus of 20 years, the painting of ‘The appearance of Christ before the people’. We stopped and spent about 20 minutes with this painting. It is very striking. John points people to Jesus. Behind him are John the apostle, Peter, Andrew and (the rather reluctant and pensive) Nathaniel. On the right are the soldiers and the Pharisees. And in the centre, walking on the rock towards them is Jesus. John sees Jesus coming toward him and declares: ‘Here is the lamb of God who takes away the sin of the world!’ (v29). And in case you don’t get it, in v36, John says to Andrew and another disciple, ‘Look, here is the lamb of God’ (v36). The faces in this image are remarkable, and well worth a study. But two of the faces that really stand out for me are the two people in the centre directly under Jesus. We see the face of the old man as he is being helped to his feet and the face of the slave helping his master to dress (he has a rope round his neck, and we assume he hasn’t been baptised). Both hear the news about Jesus and are full of joy. 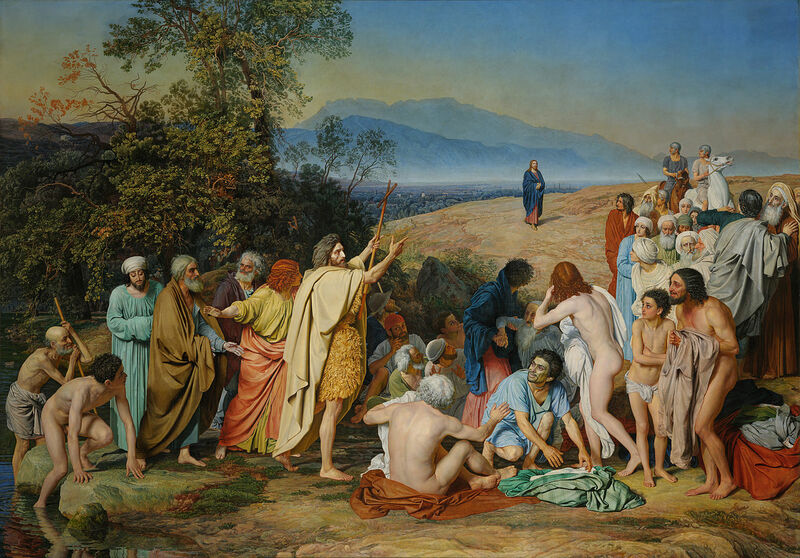 John the Baptist points those in the wilderness to Jesus. And Jesus has come to bring joy to those in the wilderness: to those who are enslaved, to those who are struggling with declining health. It brings joy to those who know that they need God. I speak to those of you who have begun to realise that you will never find joy in the little gods and goals that we build our lives on. And I point you, like John the Baptist, like Ivanov, to the one who offers forgiveness, power to change, peace, intimacy and hope, to the Son of God. I point you to Jesus.